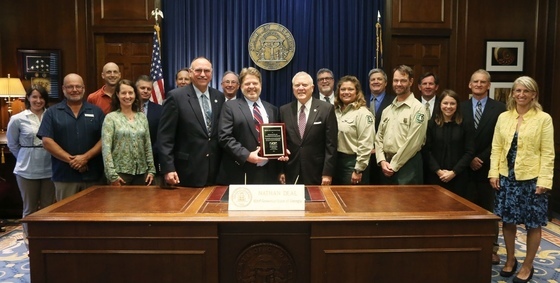 The Georgia Plant Conservation Alliance has made headlines this month, receiving a national award from the Association of Fish and Wildlife Agencies and being recognized last week by Gov. Nathan Deal. But if you’re wondering what this 21-year-old alliance is, here’s a primer. 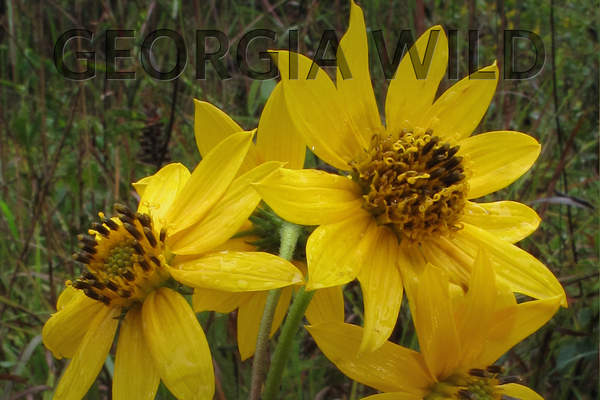 Formed in 1995, what most call the GPCA is a network of public gardens, agencies, schools, companies and conservation organizations committed – the key word – to preserving Georgia’s endangered flora. The 42 members vary from the State Botanical Garden of Georgia and Atlanta Botanical Garden to the U.S. Fish and Wildlife Service and Chattahoochee Nature Center. Full list. The GPCA initiates and coordinates efforts to protect natural habitats and rare-plant species through management, education and rare-plant propagation and outplanting. Recovery projects target 100 imperiled species statewide, from swamp pink to whorled sunflower. Members also helped develop and revise Georgia’s State Wildlife Action Plan, the guiding strategy for conserving animals and plants. GPCA’s strength is its members – participation in the alliance is voluntary – and the willingness to combine forces. The result: more resources, more collaboration and more effective conservation. This work matters because plants and the habitats they comprise are foundational to life as we know it. Yet nearly 30 plant species in Georgia are rare enough to be listed under the Endangered Species Act. Another 290 are identified in the State Wildlife Action Plan as high priorities for conservation. Serves as the model for similar networks taking root in eight other states. Has been recognized by regional U.S. Forest Service and Fish and Wildlife Service offices as worth imitating in states throughout the southern region to help federally listed species recover and help others avoid the need for listing. Will be a hot topic at the Southeastern Partners in Plant Conservation conference, Nov. 1-3 at Atlanta Botanical Garden and aimed in part at forming a network to support regional conservation of at-risk and listed plant species. Looking back: GPCA received American Public Garden Association’s 2013 Award for Program Excellence (“Nation takes note,” June 29, 2013). 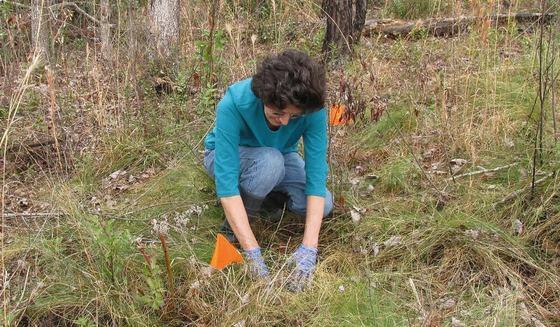 Partner with the GPCA, including as a botanical guardian, part of a statewide volunteer network dubbed GPCA’s “hands and eyes.” Guardians receive training and work alongside botanists. Buy an eagle or hummingbird license plate. Both support DNR’s Nongame Conservation Section, a charter GPCA member that depends primarily on fundraisers, such as wildlife tag sales and renewals. Consider supporting the Recovering America’s Wildlife Act of 2016. This federal bill would provide critical funding for states to conserve wildlife species that need it most, as determined by State Wildlife Action Plans. Mid-afternoon under a searing August sun is no time to fish the lower Satilla River. But Jim Page, Jason Mitchell and Ed Zmarzly aren’t exactly fishing. With long-poled nets and boats trailing voltage-packing cables, the DNR crew is searching for an aquatic invader: flathead catfish. Flatheads are an apex predator: hungry, fast-growing and capable of topping 100 pounds. The unauthorized release of the species into the Satilla in the 1990s sent the river’s prized redbreast fishery into a tailspin, until DNR’s Flathead Removal Project began netting out the mottled, big-mouthed cats by the thousands. 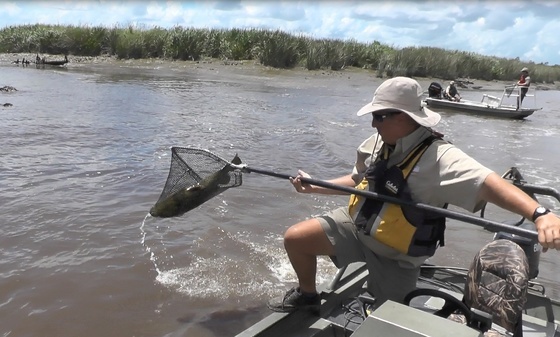 Learn about flathead control on the lower Satilla in this blog post and video. I consider the strawberry bush one our most beautiful native shrubs and one deserving of a place in home landscapes across the state. If you’re not familiar with this plant, all it would probably take is for me to show you one laden with its attractive seed capsules and you would immediately agree. 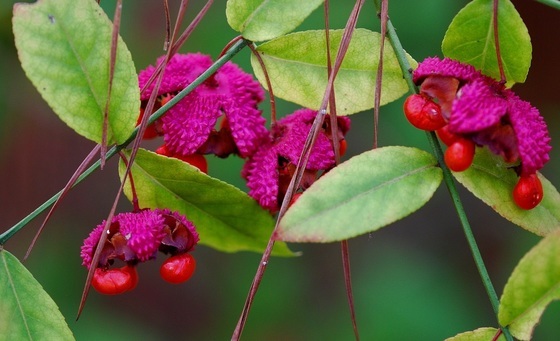 The strawberry bush is known by several unusual names including wahoo, burning bush, bursting heart, hearts-a-bursting and hearts-bustin'-with-love. Read Terry’s full column to for more on why he has a soft spot in his heart, and wants you to in your yard, for strawberry bush. Terry W. Johnson is a retired DNR nongame program manager and executive director of TERN, Nongame Conservation’s friends group. For more, check out the Out My Backdoor library and Terry’s blog, Backyard Wildlife Connection. What's life like when you study birds for living? 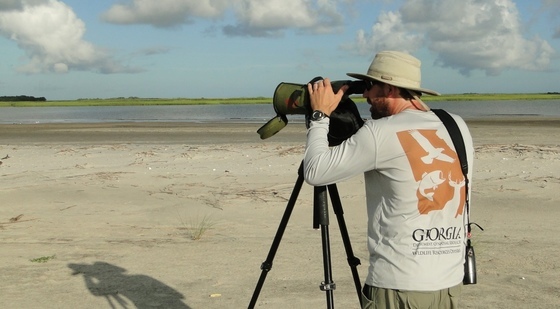 Find out in this video profile of Tim Keyes, a DNR wildlife biologist focused on conserving bird species and habitats along Georgia’s coast. Two North Atlantic right whales were found dead and a live whale was partially freed from commercial fishing gear last week off the Northeast coast. Responders cut more than 200 feet of line and buoys from the entangled 8-year-old female, while one of the dead whales, also a female, had gear wrapped around its head, mouth, flippers and body, according to NOAA Fisheries. Entanglement in fishing gear is a leading threat to these endangered whales, which calve in winter off Georgia and north Florida. A dead pine and dangling camera didn’t deter nest cam operators at The Landings. Although the nest tree is dead, project leaders – after being cleared by federal and state authorities – built a bracket to support one cam on the tree and attached two more cams on a nearby pine. See the results at georgiawidlife.com, on Cornell Lab of Ornithology and at The Landings bird cam homepage. Thanks to all who took part in last month’s reader survey. Five respondents randomly picked to receive a Weekend for Wildlife trunk organizer are being notified, and survey results will be used to make Georgia Wild even more informative. The white fringeless or monkeyface orchid is being federally listed as threatened. Yet DNR and partners Atlanta Botanical Garden and the Georgia Plant Conservation Alliance continue to enhance the state’s nine known natural populations and create safeguarding sites, such as at Chattahoochee Bend State Park. 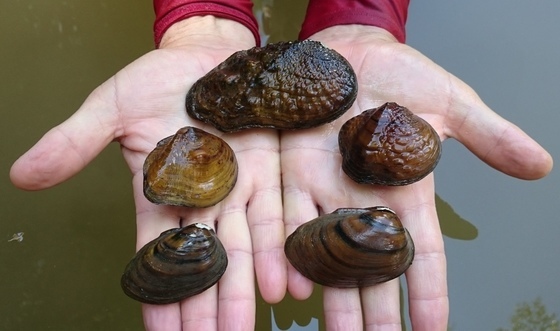 So you know freshwater mussels? Pictured are a pistolgrip (top), threehorn wartyback (middle left), ridged mapleleaf (middle right) and two southern clubshells (bottom), only a few of the species Nongame Conservation Section staff found while sampling the Conasauga River near Dalton last month. Some young sea turtles took a beating from Tropical Storm Julia. About 13 “post-hatchling” loggerheads stranded alive in sargassum mats that washed onto the beach were taken to the Georgia Sea Turtle Center for rehab and release offshore. Want to schedule a class field trip to the Go Fish Education Center? Call soon – field trips are scheduled for 9:30 a.m.-12:30 p.m. Tuesdays, Wednesdays and Thursdays. Names in the news: Britt Pendergrast, former manager of the Georgia Heritage Trust program under Gov. Jimmy Carter, died at age 99 last week. Former Lt. Gov. Pierre Howard was honored as Georgia’s Distinguished Conservationist at the Georgia Conservancy’s annual ecoBenefete. UGA student Ashley Block, who had a keen interest in plants, conservation and communication and was pursuing a doctorate in integrative conservation and anthropology, died after being hit by an SUV during a group night bicycle ride Sept. 12. Charges against the driver include driving under the influence of drugs. 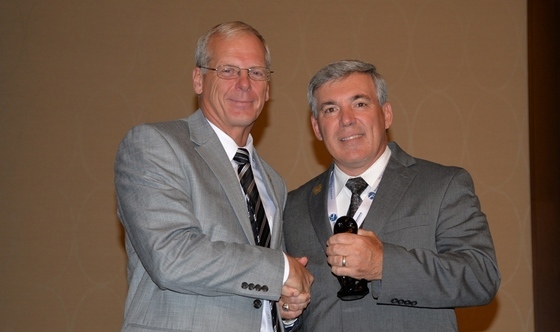 Dan Forster, former DNR Wildlife Resources Division director, received the Seth Gordon Award from the Association of Fish and Wildlife Agencies this month. Named for a noted wildlife conservationist, the honor is the highest given by the organization and recognizes lifetime achievements of natural resources administrators. Forster began work with DNR in 1990 and recently retired as Wildlife Resources director. His leadership in national wildlife affairs runs deep, varying from Association of Fish and Wildlife Agencies president to Recreational Boating & Fishing Foundation board of directors and as a proponent in standing up the Blue Ribbon Panel. The panel’s work resulted in the Recovering America’s Wildlife Act, legislation to provide critical funding for states to successfully implement State Wildlife Action Plans and conserve at-risk species. Forster is now government relations director for the Archery Trade Association. He and his family live in Social Circle.